As the summer quietly winds down, the kids are back in school and the crisp bite in the air has announced fall. I enjoy this time of year where the leaves turn their magical colors, the smells of the seasons are everywhere and colorful pumpkins and squashes have begun to pop up. This is the season to roast vegetables and I could not be happier! Don’t get me wrong, I will miss the summer days of outdoor barbeques, the picnics in the parks, and the dinner parties on the deck. Fall, is the slow ease into winter that now has me chomping at the bit for roasted vegetables, soups and meals that warm the soul. 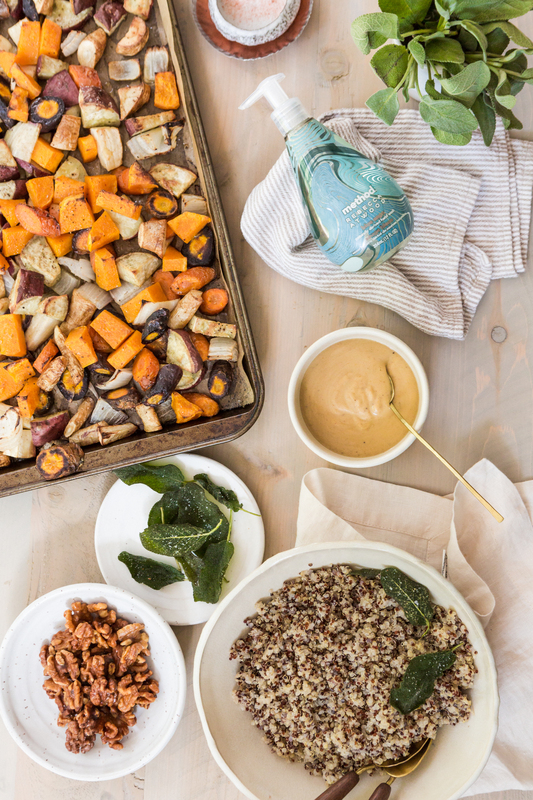 Recently, a creative inspiration for a fall recipe came from method’s new fragrance, Blue Sage by the talented Brooklyn based designer Rebecca Atwood. This beautiful, limited-edition and naturally derived scented gel hand wash captures a crisp autumn day with notes of juniper, cypress and sage. Blue Sage is one of four fall-inspired fragrances packaged in a sophisticated and painterly bottle made available exclusively at Target (in stores and online). Its around this time of year, I like to add richer herbs into my meals. method’s Blue Sage reminded me how I love cooking with fresh sage. This aromatic herb is so versatile and is absolutely perfect to fry and crisp. 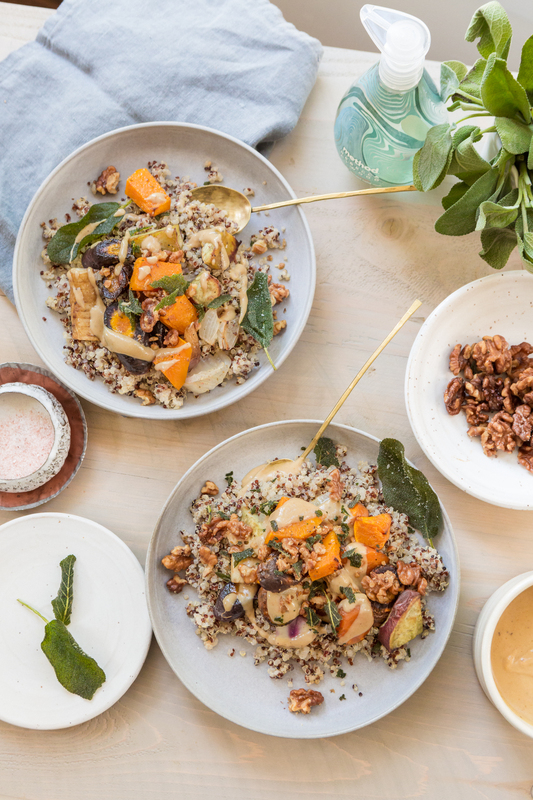 With fall vegetables readily available, an inspired Roasted Fall Vegetable with Crispy Sage & Walnut Quinoa Bowl is a complete meal for those cooling days ahead. This quinoa bowl topped with roasted vegetables is a seamless introduction to fall. For the finishing touches sprinkle crispy sage leaves and crunchy walnuts on top. My favorite part of this meal is the delicious tahini sauce generously drizzled as the finale. As a mom, a healthy, nutritious and warming meal to feed your loved ones is what Fall is all about. It’s also about making sure my family is exposed to environmentally safe products. Method products are animal-friendly, climate conscious, and environmentally responsible. To view the full line of method + Rebecca Atwood limited edition, naturally derived hand wash fragrances go here. Visit the feedfeed website to enjoy the other method Home + Rebecca Atwood inspired recipes created exclusively for this product line. 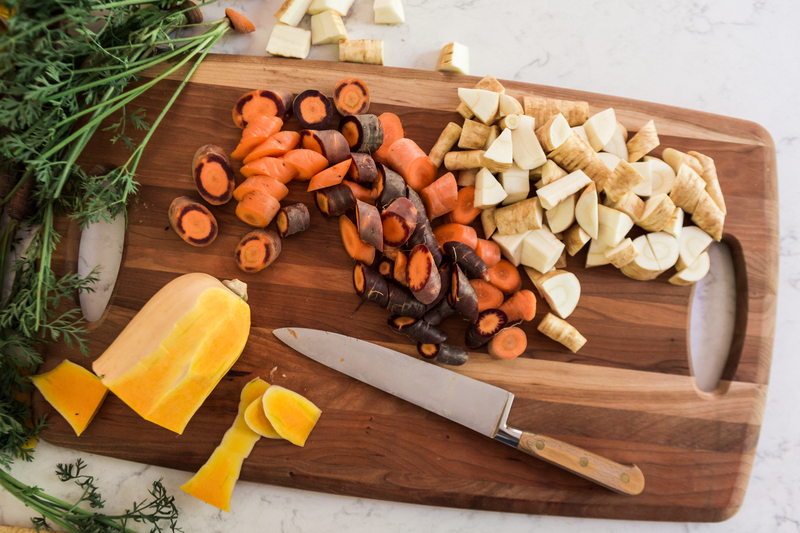 Chop all vegetables to roughly 1” pieces. Spread on lined cookie sheet. Drizzle with 2 tablespoons of oil, S+P and roast in a preheated 425 oven for 25-30 minutes – or until vegetables are golden and tender. While veggies are roasting, heat 2 Cups of oil in medium size sauce pan to 300 degrees. Drop sage leaves in. The leaves will bubble and spatter for 30 seconds. Leaves should be crunchy and crisp. Remove with tongs or spider and drain onto paper towel. Load your spider up with 1 cup of untoasted walnuts. Give them a flash dip in the hot oil to toast. Set them on paper towel with sage leaves. Sprinkle with salt. Set aside. Mix ingredients together with a whisk and set aside. Put one cup of quinoa in bottom of bowl. Place ½ cup of mixed roasted vegetables on top of quinoa. Drizzle ¼ cup of tahini sauce over quinoa bowl. Top with crispy sage and walnuts. Enjoy! *Disclaimer: This post was sponsored by Method Home and feedfeed. All opinions and thoughts are my own. A big THANK YOU to Method Home for their generous provision of the Rebecca Atwood Blue Sage hand wash products to create this recipe and post.